Avoid positioning your furniture in direct sunlight or too close to a radiator (leave at least a 12” gap from a radiator). Avoid prolonged contact with hair gels, sprays, body creams and moisturisers, etc. In time, these will remove/ damage the protective topcoat and discolour the leather. Similarly, natural body perspiration can have the same effect. This can be particularly noticeable in the areas of high contact, e.g. on the arms of the furniture. In both cases regular cleaning to remove any build-up of oils, etc.will help minimize the effects of this. We do offer a range of fabric arm-caps which can help protect these areas. Please ask in-store for details. Avoid contact with any sharp objects which can damage the hide, e.g. belts, buckles, brooches, metal studs, zips, etc. Do not leave newspapers, etc. on the furniture as the ink can migrate causing discolouration. Similarly, certain darker items of clothing can cause discolouration/dye transfer e.g. denim, so please avoid prolonged contact with such materials. This problem is particularly apparent on lighter shades of fabric and leather. Do not allow pets or animals to climb on the furniture. Sharp claws will damage the leather and natural oils from their coat may damage the fabric. Light dirt and dust will increase wear on the fabric and can dull the colours, giving a faded appearance. 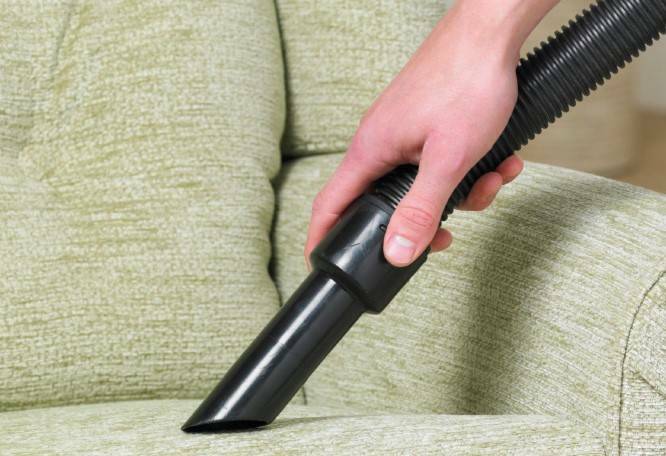 We recommend vacuuming your furniture at least once a month and going over it with a soft brush. Never use a stiff fibre or metal brush as this will damage the fabric. 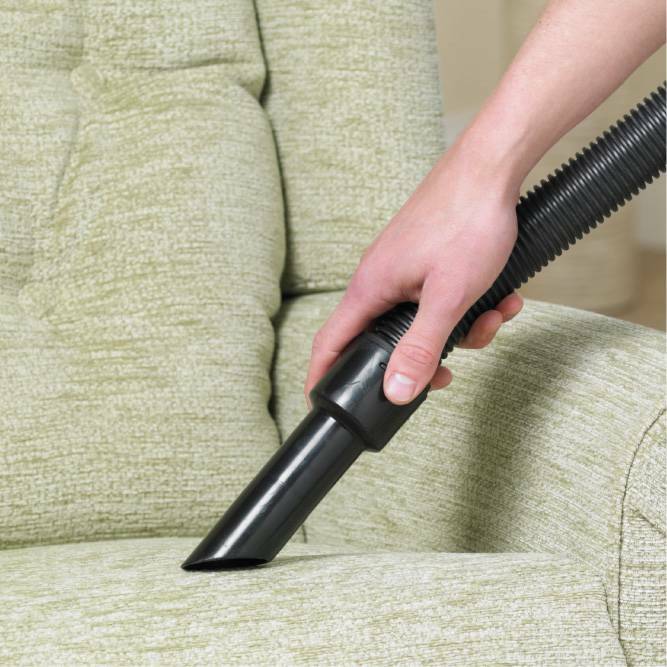 We advise that cleaning of upholstered furniture should be carried out by a specialist. Wet cleaning is not recommended as this can cause the colours to ‘bleed’– it may also leave a permanent mark and cause puckering or damage to the foam filling. Please make sure you follow our guidelines as we are unable to accept responsibility for any damage during cleaning. Sitting on the edge of the seat cushion will cause premature wearing and distortion of the fillings. Some fabrics may fade in time if exposed to strong sunlight over long periods – please consider this when positioning your furniture in the room. These luxurious textured fabrics can have a tendency to crush, crease and flatten during normal use. This is not a fault or sign of wear but is simple pile displacement that is an inherent characteristic of these types of fabrics. Where the seat cushion is removable, this should be reversed on a regular basis. These are pile fabrics and should be brushed lightly with a soft brush or vacuumed lightly on a low suction in order to optimise appearance retention. 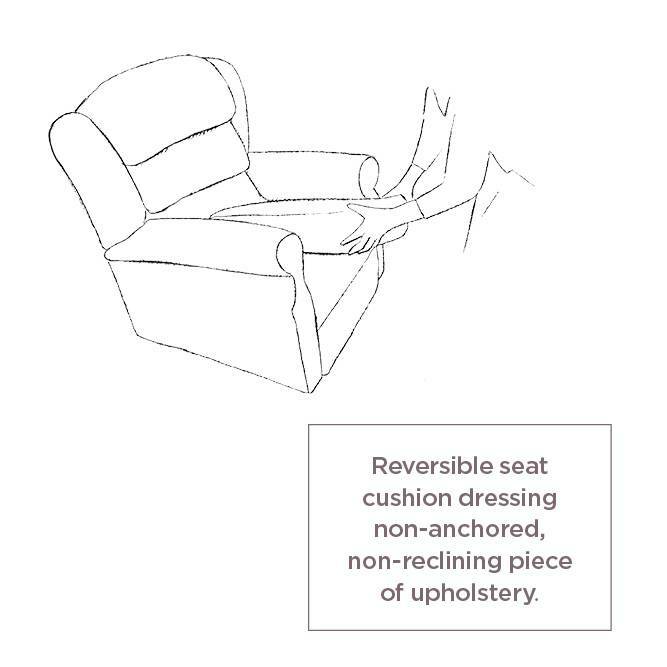 To ensure safe and effective operation, all our reclining products have seat backs and cushions that are sewn into place. This anchoring of the back and quilt prevents the movement of the parts and allows for easy operation of the reclining action. Loose seat cushions and/or backs, can interfere with the reclining mechanism. 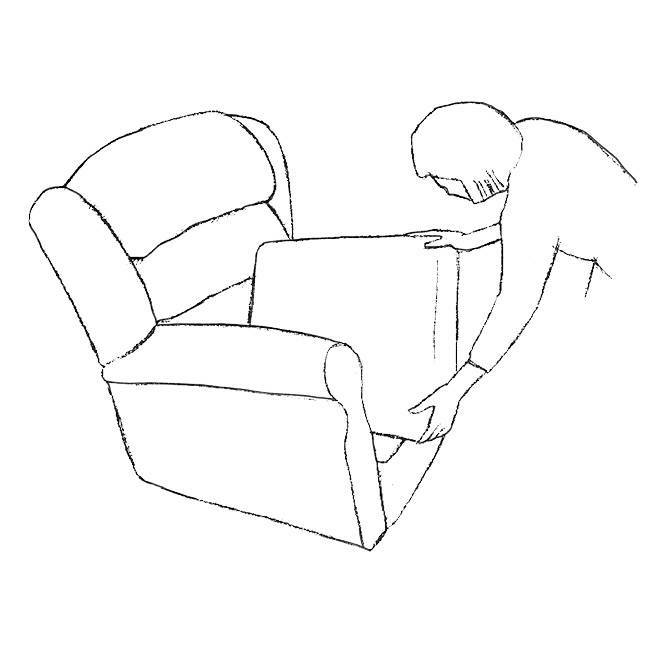 Being anchored into place means the cushion/back cannot be removed and reversed as you can do with a non-reclining piece of upholstery (see diagram below). Consequently the recliner will require more maintenance. 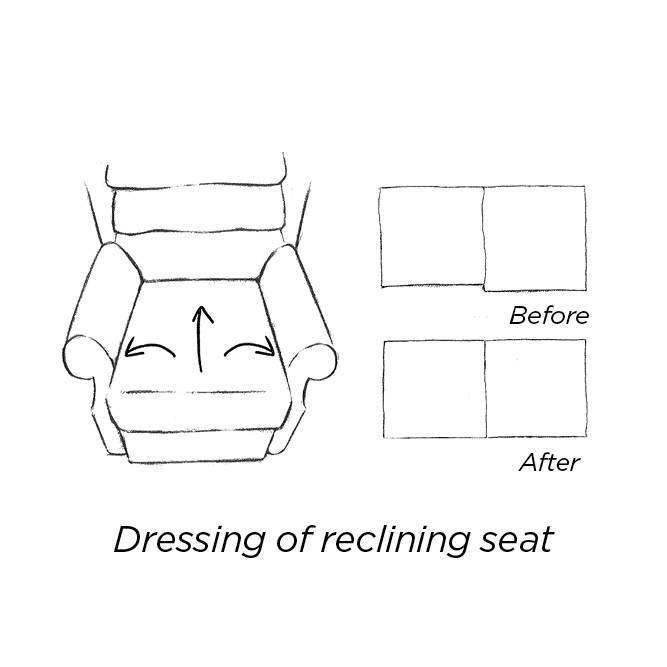 Daily dressing of the cushion as described over the page, will help maintain the original look and form of the recliner. 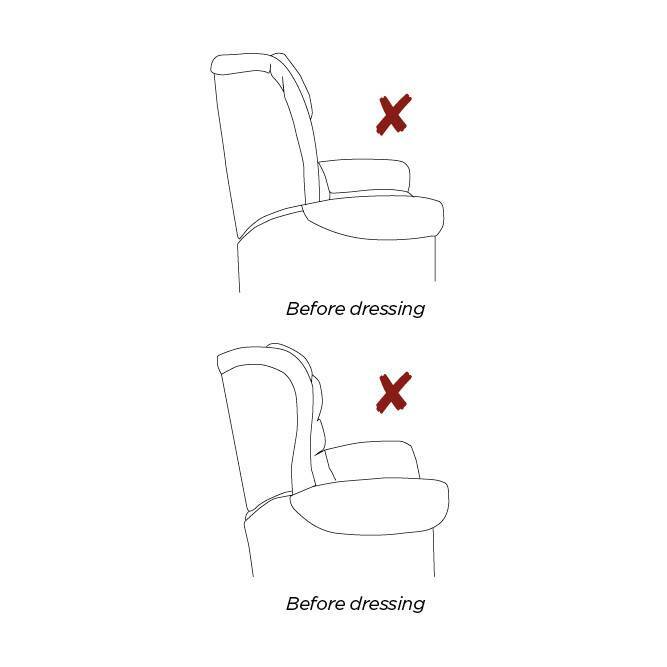 To dress the cushion, simply use your hands, push the seat cushion towards the back of the chair and smooth the fabric to each side of the seat (see diagram below). Gently beat the cushion with your hands to allow the foam to recover and remove any slight indentations that may have appeared in the cushion after prolonged periods of use. The movement of the seat cushion is particularly noticeable on 2 and 3 seat sofas where the cushion is sat upon. As the seats move independently this can give the appearance of the seats not lining up with each other. This effect will become more pronounced if the cushions are not dressed daily and it is almost inevitable if one side of the sofa is used more. Please note that all our seat cushions are lined up in our factory prior to despatch, but it is likely that they will move once sat upon. All recliner cushions need to have what appears to be additional or extra fabric around the knee roll area when closed. 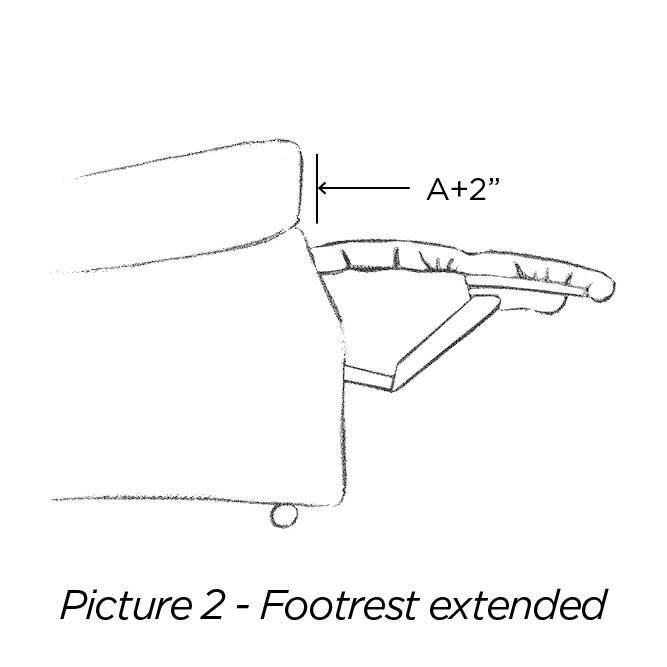 This is because when the footrest extends it elongates by up to 2”. Extending in this manner allows the footrest to offer as much leg support as possible. 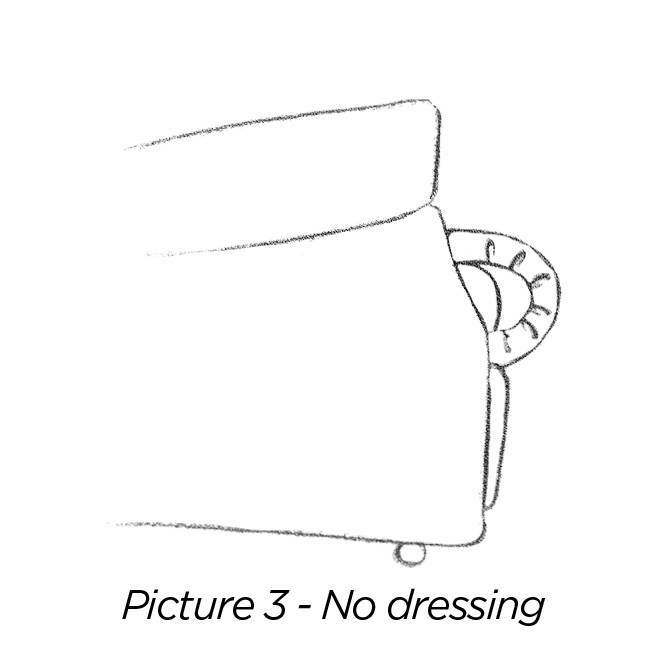 One effect of this feature is that the cushion may appear to stick out slightly when viewed from the side of the chair or sofa (see diagram below). If left undressed this overhang will become more pronounced and appear to deepen the depth of the seat. 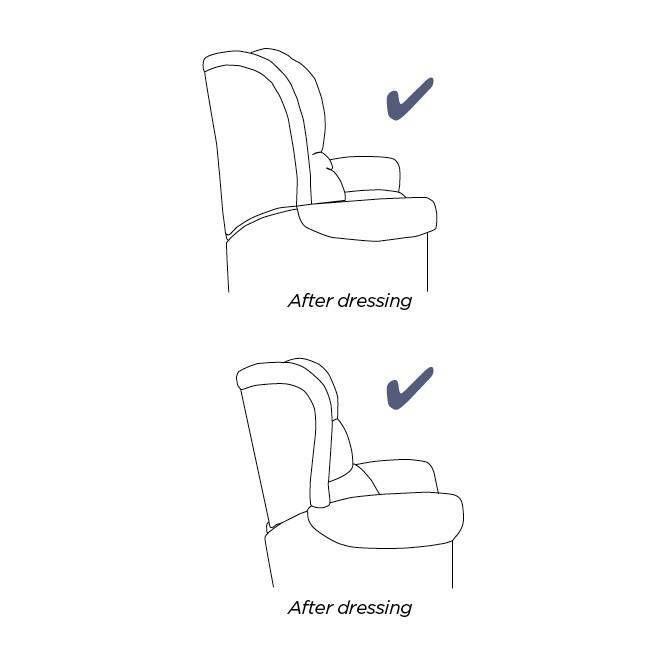 We therefore recommend that the seat cushions are dressed daily after use to reduce this effect. Chair and sofa backs are filled with soft-fibre filling to give the level of comfort required with a reclining chair or sofa. 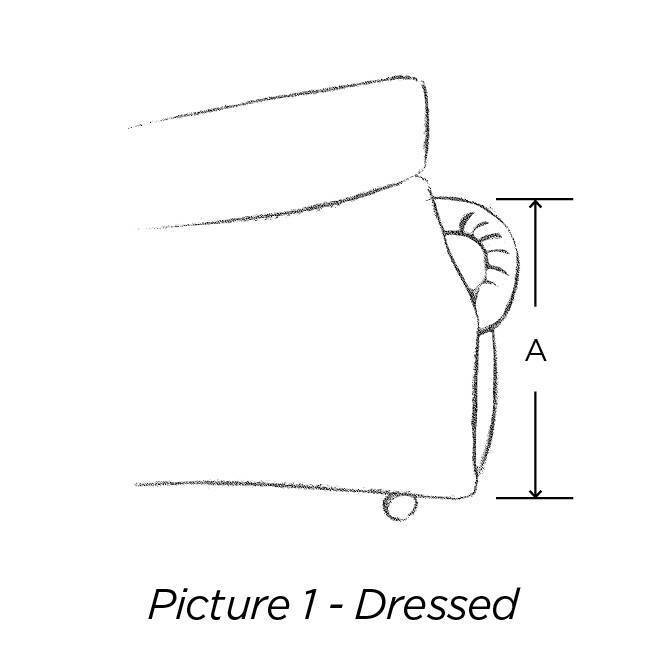 The make up of the back cushions in chairs, recliners or sofas are very similar to that of a pillow; the filling will flatten with use and will require regular plumping up (see diagram below). We therefore advise that the furniture back is dressed on a daily basis. Gently beat the cushion to redistribute the filling and give more lift and hence comfort to the cushion back. It is particularly important that with two or three tier pillow backed chairs/recliners/sofas, that the pillows are regularly plumped up to retain their original comfort. We know that when used correctly your new leather furniture will provide you with many years of satisfactory and reliable service. Before using your new leather product, please read these care instructions as, being a natural material, leather does behave differently from man-made items and requires different care to fabric upholstery. Being a natural material each leather piece can display different marks and characteristics. As such, no two pieces of furniture will be identical. Even within one item, separate areas can display different characteristics or shading due to being made from two different hides. Consequently, leather furniture can show many different marks caused by healing scars, insect bites, creases, veins, growth lines, grain variation, etc. All of these are not faults but are natural features, which help give leather its unique character. None of these natural markings will affect the durability or performance of the furniture. Shade variation therefore has to be expected and whilst we make every effort to minimize this, swatches, samples and store displays should only be used as a guide to the colour. Also, as the product ages, shade variation will occur on each piece as the leather mellows and again this can vary within different areas of each piece of furniture. Specifically areas where the leather is upholstered tighter to give a neat appearance (e.g. under the arm). The best method to clean leather is to regularly vacuum and dust with a soft, clean cloth. Occasionally use a damp cloth (not too wet) to clean your furniture. Ensure the cloth is free from grit and use gentle, circular motions to clean any area. Hard, repeated rubbing of leather will remove the protective layer and cause removal of the colour and damage the product. Immediately dry with a soft, clean cloth or leave to dry naturally. Should there be areas requiring more attention apply lukewarm weak soapy water as above and dry immediately. If required, occasional application of a neutral leather cream will help restore the sheen to the leather. Only use proprietary product and follow the manufacturer’s instructions. Should any spillage occur, clean the area immediately as the longer any liquid remains on the surface the greater the chance of lasting damage. Use a dry cloth to absorb as much of the liquid as possible, dab the area and do not rub excessively. Direct heat (from hair dryer, radiator, etc.) to dry the leather as this can dry the leather too quickly and cause cracking to the hide. If you have any doubt about the suitability of any cleaner, try it on a less obvious area of the chair / sofa first.